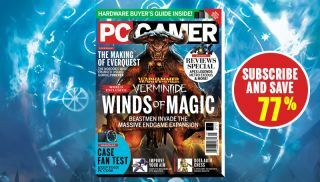 Subscribe to PC Gamer magazine for $6.50 for three months, saving 77% A great time to subscribe to our long-running magazine. News Also: The Outer Worlds, Artifact, Just Cause 4, our 2019 preview and more! news The sale has already kicked off. And 20 percent off everything from My Favourite Magazines. News Also: Assassin’s Creed Odyssey, Soulcalibur 6, Thief’s 20th birthday and the final part of our History of Strategy. Magazine Also: Forza Horizon 4, Imperator: Rome, our 25th birthday celebrations, our SSD group test and more! Magazine Also: Two Point Hospital, Assassin's Creed Odyssey, WoW Battle for Azeroth, our gaming mice group test and more! Magazine Also: Our Fortnite supplement, Desperados 3, Monster Hunter: World, our monitor group test and more! Magazine Also: Ni no Kuni 2, Far Cry 5, Sea of Thieves, our premium PC case group test and more! Magazine Also: Our Game of the Year Awards, the history of Ion Storm part one, our budget GPUs group test and more! Magazine Also: Indie games special, our 2018 preview, the history of Ion Storm part two and much more! Exclusive New screenshots and impressions of PUBG's next arena, and the athletic new ways to get around in it. The people who make PC Gamer. Magazine Also: Star Citizen alpha 3.0, Assassin's Creed Origins, Metal Gear Survive, our keyboard group test, and more! magazine Also: Quake Champions, Call of Duty: WWII, our round-up of the best flight sticks and more! Magazine Also: Far Cry 5, Shadow of War, XCOM 2: War of the Chosen, our processors group test, and more! Magazine Also: Bayonetta, Total War: Warhammer 2, Tacoma, Outlast 2, our PC cases group test, and more! Epic Tales Our comprehensive guide to PC RPGs spanning four decades—from Dungeon to The Witcher 3. Squad goals We learn about the 16-year-old MMO's allure from its venerable community of adventurers. Magazine Also: Middle-earth: Shadow of War, The Surge, Ruiner, our gaming headset group test and more!